To book tickets for the caves, please visit our booking page. The Museum would like to give huge thanks to Denbies for their support and for sponsoring the hard hats for use on the tours. Here are a couple of comments from satisfied customers. I just wanted to thank you for organising our cave tour; we all thoroughly enjoyed it. I have already thanked Richard who gave us an excellent and fascinating tour, but please pass our thanks on to Jean and Jim Harvey, it was well worth the visit and the kids loved the experience too. The caves are a great asset to Dorking and it is wonderful that such a dedicated group have managed to re-open them and we can all enjoy them. What a splendid tour we had this morning. It was thoroughly enjoyed by all of us. Thanks to all your team for lovely time. 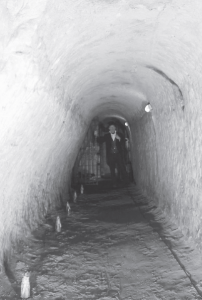 Thank you to Professor Richard Selley for the following information on the history of the South Street Caves. Many of the shops and houses of Dorking have extensive cellars and inter-connecting galleries. When Sainsbury’s was being built in the High Street a huge cave was discovered beneath what is now the car park. The walls of this cave were painted with trompe l’oeil pillars of unknown date, unfortunately, in order to carry on with Sainsbury’s car park, these caves were filled in with concrete. It is thought that the Caves were built to store wine, as the temperature remains at 14°C (58°F) all year round. The caves were originally privately owned by various brewers, vintners and grocers. They were sold to Dorking Urban District Council in 1912, which leased them to successive wine merchants & grocers until the 1960’s. The Dorking and Leith Hill Preservation Society took over the lease in 1970 and opened the caves to public tours. 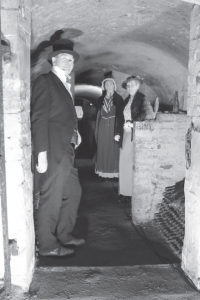 Dorking Museum now has the Licence to run tours of the Caves which will run from May to October each year, starting in 2015. (More details at the bottom of the page). The present entrance to the caves is beside the War Memorial. South Street was once a narrow lane such as West Street remains. Prior to the widening of South Street to accommodate the War Memorial and Bandstand in 1919 (the latter was removed in 1963) the entrance to the caves was through a door in the back garden of a cottage fronted onto South Street. However, the Rotunda (Dorking Appliances) was built in the grounds of Butter Hill House, Butter Hill House’s original boundary extended to South Street, but was later sold off to permit houses to be built. This implies that the original entrance to the caves was in the grounds of a grand house, not in the back yard of a labourer’s cottage. In plan view there are 4 interconnecting galleries called the northern, eastern, southern and western galleries. Probably late 17th century: The north, east, and eastern part of the southern galleries, the staircase, and the ‘Mystery chamber’. Early 19th Century: The western part of the southern gallery and the western gallery, at which time galleries old and new were furnished with brick wine bins. 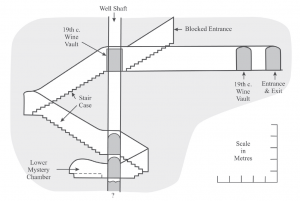 Two of the well shafts can be seen on the upper level. They are only about 2 metres apart and presumably provided water for adjacent properties on Butter Hill/Victoria Terrace. The shafts have been backfilled close to present floor level. It is still possible to see paired recesses cut on either side, presumably for cross-timbers to form a ladder during excavation. Above each recess a sooty stain shows where rush lights would have provided illumination. It is believed that the main parts of the caves were excavated in the late 17th century. The walls are smooth, the profiles regular, suggesting excavation using a template, and the heights (commonly some 2 metres) remarkable and curious. 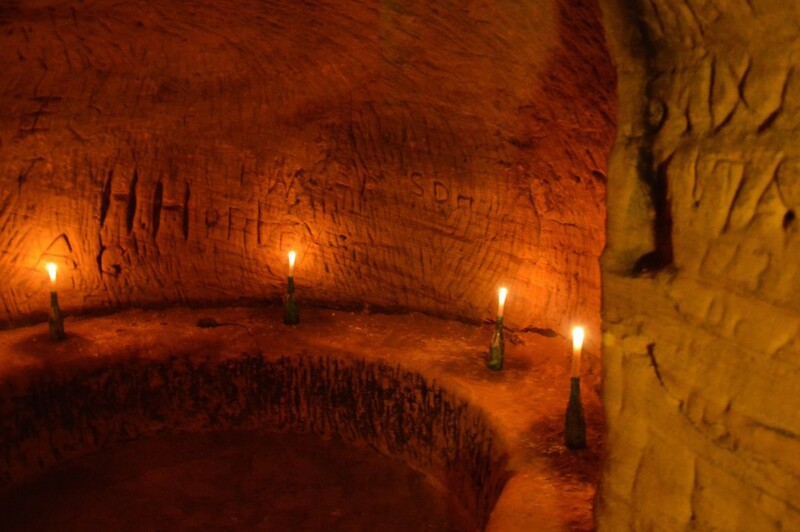 The walls of the caves are covered with many inscriptions, principally dates and initials. The beautiful calligraphy and soot-blackened cover to the lettering suggests that they are ancient, and may be taken at face value, as having been carved in the years stated. Accordingly the oldest date visible is 1666 on the wall of the gallery to the well half way down the shaft to the mystery chamber. The next oldest date is 1672 in the well shaft itself. The cave complex would have been originally entered down a steep staircase in the grounds of Butter Hill House. This entrance is now bricked up, but would exit just above the modern War Memorial. From the original entrance the staircase is interrupted by a landing, to the left a gallery extends through the third well shaft and connects at right angles with the eastern gallery which leads to the present entrance. To the right of the landing is a doorway, now labelled ‘Vintage Port’, leading to the southern gallery. Immediately beyond this door there is a circular chamber through one passes to reach the 19th century wine vault. 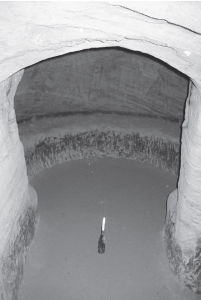 A narrow bench is carved out on either side of this chamber. This geometry is very similar to the deeper ‘Mystery chamber’ and maybe this one was an early version. The excavators possibly decided to abandon it and excavate the shaft down to the Mystery Chamber. criminal or religious gatherings, noting that the late 17th century was a time of great religious disturbance. It could have served as a ‘Priest’s hole’ for Roman Catholics or it could have been that the ‘Mystery chamber’ was cut by a man who spent all his money on the folly. He ended up in Dorking poorhouse, on the opposite side of South Street. Another theory is that the ‘Mystery chamber’ was excavated as a folly, by the owner of Butter Hill House, in whose grounds the entrance lay. To the right of the entrance of the ‘Mystery chamber’ a short gallery leads to the well. The well still contained water in the 1920’s when history relates that a town councillor fell in during a tour of inspection. The northern and southern galleries were used for wine storage in the early 19th Century. The oldest date carved on the walls of the northern gallery is 1815, with others of the early 19th century. The initials include W C and Cheesman, possibly for William Cheesman (The caves were owned by a John Cheesman, perhaps his father, in the late 18th century). The initials G K may relate to the later occupancy of the vaults by George Kingham, the grocer whose company rented them until they were returned to the council in the 1960’s. The two galleries contain 42 bricked stalls or bins, each of which, apparently, was capable of containing 700 bottles. Upper: Geophantasmogram of Dorking and its surroundings showing the relationship between geology and scenery. Interbedded sedimentary strata of the Cretaceous Period dip north forming the northern limb of the Wealden anticline, the southern limb of the London basin. Wellcemented hard strata form hills, soft sediments form valleys. 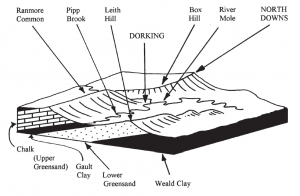 Dorking’s caves were excavated in the soft Folkestone Sands at the top of the Lower Greensand. Dorking lies where the River Mole has cut a gap through the North Downs, separating Ranmore Common in the west, from Box Hill to the east. 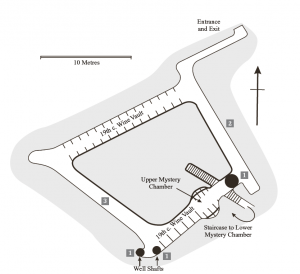 The North Downs are composed of a resistant ridge of Chalk, a variety of limestone. At the foot of the North Downs lies an east-west aligned valley , across which the River Mole flows towards Dorking from the east, and the Pipp Brook from the west. Beneath the Gault Clay is the Lower Greensand. The uppermost unit of which, the soft rusty yellow sands of the Folkestone Beds, crops out in a series of quarries through Dorking. Beneath the Folkestone Beds the Lower Greensand is better cemented and more resistant to weathering, giving rise to the chain of hills that includes the Deepdene, the Nower and Leith Hill. The Lower Greensand overlies the heavy sticky Weald Clay famous for its dinosaur fossils, such as Iguanodon and Baryonix. Fossils are very rare in the Lower Greensand, but include occasional shells including those of ammonites, a marine fossil. 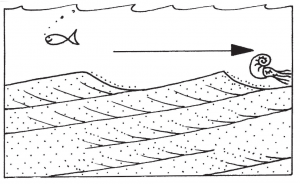 Lower: Geophantasmogram to show how cross-bedding forms in sand. Prevailing westerly dips of the cross-bedding in the caves and adjacent quarries and outcrops indicate tidal currents flowing from Redhill to Guildford, some 120 million years ago. Buy “Dorking’s Famous Caves” in our online bookshop.